University heads are warning that the tightening of student visa rules risks undermining the drive to raise income from overseas students. Universities UK's president Eric Thomas says university-sponsored overseas students should be removed from migration figures. A survey commissioned by the university group claims the public undervalues the financial worth of overseas students. Immigration Minister Damian Green said visas had been "abused for too long". The organisation representing the university sector is warning that the government's tougher approach to student visas is putting at risk billions of pounds in potential revenue from overseas students. Universities UK is holding a debate in London on Wednesday on the impact of student immigration policy on the recruitment of overseas students. 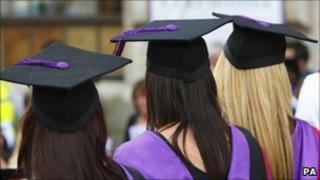 It follows efforts by the government to clamp down on migrants who use student visas as a route to working in the UK. With increased competition and pressure on funding, many universities in the UK have looked to the lucrative overseas student market. Professor Thomas says overseas students are worth £5bn per year to the UK and that this "export industry" could be worth £16.9bn by 2025. But universities fear that this recruitment drive is getting entangled in the government's efforts to lower the headline figures on immigration. "The government could help grow this area of the economy by removing university-sponsored students from net migration figures. They should do this because the majority of students simply come here, study, and then leave," said Prof Thomas. Universities UK says the debate about immigration has left the public unaware of the economic value of overseas students. A survey commissioned by the group also suggested that a third of the public believed that the rise in overseas students meant the loss of places for UK students. Prof Thomas said the negative impression of overseas students was "worrying reading" and showed the "misunderstanding about the positive contribution international students make". "The government's approach to student visas must be proportionate and workable, and should not be imposed at the expense of our international reputation and our economic growth," he said. The most recent application figures, published by the Ucas admissions service, showed that the number of overseas applicants from outside the European Union were 13% higher than at the same stage last year. Immigration Minister Damian Green rejected the suggestion that visa regulations could damage legitimate recruiting of overseas students. "There is no incompatibility between a strong university sector and tough border controls," he said. "We are reforming the student visa system because it has been abused for too long, with providers selling immigration, not education."